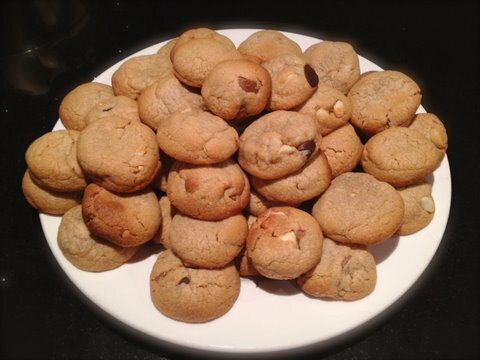 Choc Chip Macadamia Peanut Butter Cookies in 5 easy steps! Well then. If you are reading this recipe, you are pretty much screwed when it comes to controlling your life. 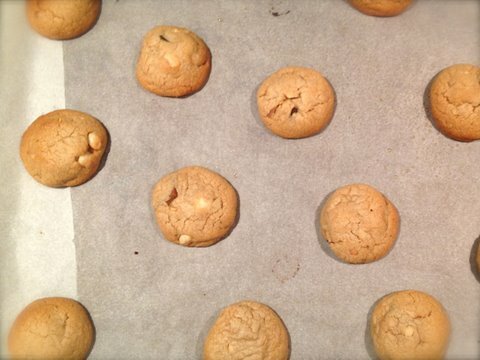 'Tis is a fool-proof cookie recipe, so at the very least, you’ll be able to control your cookies. Eating them is another matter entirely. 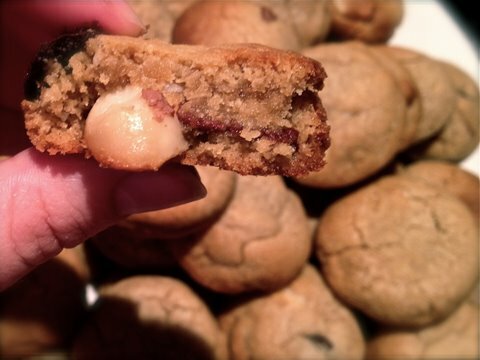 This recipe makes about 50 incredibly tasty cookies. It will take you 10 minutes preparation time, 10 minutes cooking time and 10 minutes cooling time. Be warned: they are addictive! 1. Preheat oven to 175°C and line as many oven trays as you can with baking paper! 2. 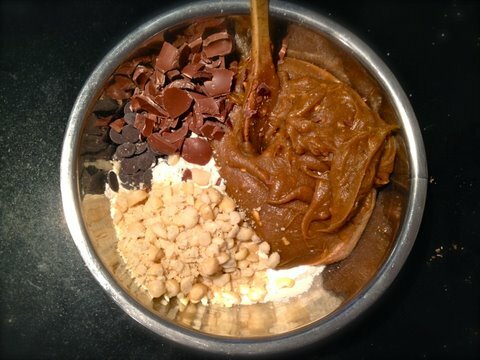 In a big bowl, combine caster sugar, brown sugar, eggs, melted butter and peanut butter and mix until silky. 3. Add flour and baking powder, stirring as you go, until combined. 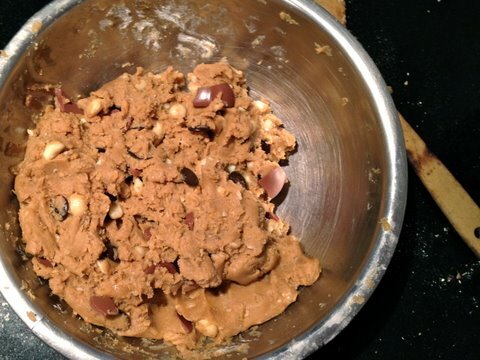 Then mix in chocolate chips and macadamia nuts. 4. 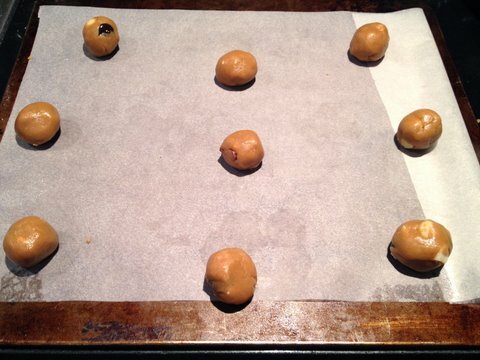 Roll dough into ping-pong ball-sized spheres and place on baking tray with plenty of space between each. 5. Bake for 10 minutes or until barely golden at the edges. 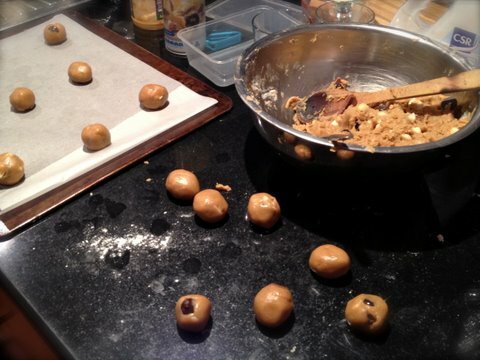 NOTE: Cookies will be quite soft when they come out of the oven. Let them cool for 10 minutes and they will firm up! Thanks Ames! Now go make yourself a nice big batch, hire a movie, and stuff your face! I never bake. Like, seriously - NEVER. I love cooking, just not baking. And now I've made two things in two weeks from your blog! These cookies were flipping awesome, about 8 minutes in my fan forced oven was perfect. Love the texture, the flavour and the complete lack of nutritional value. Yum and thank you for the recipe!